Liberal, fast-paced and modern, the city of A Coruña also has a poetic soul that links it with the English romanticism of the nineteenth century. The relationship comes from a long way back and began with a tragic event that any neighbour is capable of referring to: the Battle of Elviña and the death in combat of the British officer Sir John Moore. This worship of romanticism also has a prominent location in A Coruña. It is the Garden of San Carlos, an oasis in the midst of the city’s turmoil. The park was located in the space that was once occupied by one of the main fortresses that guarded the city, Seen from afar it is quite clear that its base is that of an old castle, originally (in the fourteenth century) located outside the walls and later attached to them. This was a place of destruction: in 1658 a worker’s carelessness caused the powder keg located inside to explode, tearing the place into a thousand pieces and, at the same time, taking dozens of lives and severely damaging the San Francisco convent, of which there are barely any traces left behind the church of the Third Order. The explosion must have been so frightful that for almost two centuries the people of A Coruña came out in procession every year to offer the so-called vow of gunpowder, asking the heavens something that horrible would never happen again. After this destruction, the place was transformed into a silent garden arranged around the tomb of the Battle of Elviña hero, Sir John Moore. The battle took place in the midst of the Napoleonic wars. In the first days of 1809, Moore was fleeing from the centre of Spain, pursued by French troops chosen among the best at the Emperor’s service. His intentions were to embark the English army at the port of A Coruña. While waiting for the ships needed for the evacuation, he was forced to face the enemy in the hills of Elviña, at the entrance to A Coruña, just a village back then and today the place where the University is located. On the 16th the two armies fought and Moore received a bullet wound from which he would die hours later. Most of the British troops managed to sail before the French, commanded by Marshal Soult, breached the walls on the 18th. Moore’s body lies buried in a stone urn in San Carlos, in a tomb where you can see, now as ornaments, various war devices such as cannons or bombs. Around the tomb there are also acknowledgements to the English official’s bravery: Wellington’s words reminiscing about the war (“Spaniards, dedicate your life to imitate the inimitable Galicians”), a poem by the English romantic Charles Wolfe, and another by Rosalía de Castro are engraved on marble along the walls. 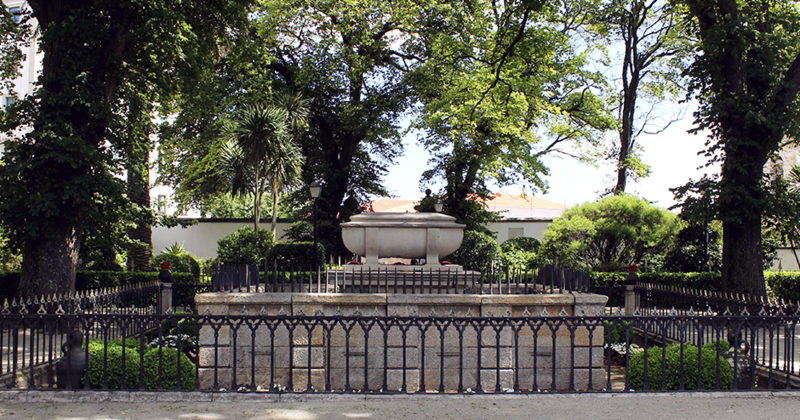 The garden is an unskippable stop on any walk through the more traditional A Coruña. It is also well surrounded by buildings that will appeal to those who want to know the Community’s past: the Arquivo do Reino de Galicia (Archive of the Kingdom of Galicia), the Military Museum and the Seoane Foundation, dedicated to the illustrious twentieth century painter, are located next to this park which, in addition, is a privileged watchtower from which to observe A Coruña’s port and bay area. Also, delving into the British connection of the city, a plaque commemorates the 172 sailors who died in 1890 in the sinking of the HMS Serpent near Camariñas.